Some PDP Leaders, Govs Working For Buhari’s Re-election? Ahead of the forthcoming general elections, indications have emerged that some governors and chieftains of the main opposition party, the PDP, are working for the re-election of President Muhammadu Buhari. The governors, it was learnt at the weekend, have been meeting secretly with key government officials and the leadership of the APC to plot strategies on how to deliver huge votes to Buhari in the 2019 general elections. 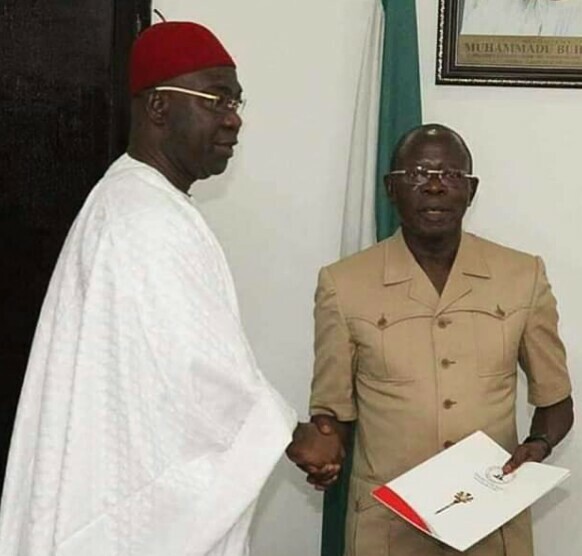 A competent source, who is privy to the arrangement, said that most of the PDP governors and leaders involved are those from the Southern part of the country and a few from the North, especially North-East where the PDP presidential candidate, former Vice President Atiku Abubakar, hails from. 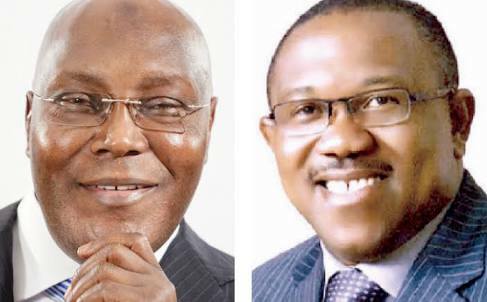 According to the source, who prefers anonymity, PDP governors from the South-East and South-South are particularly unhappy with the choice of Mr. Peter Obi, former governor of Anambra State, as running mate to Atiku for the 2019 presidential election. The South-East governors had earlier fiercely opposed the Atiku/Obi ticket because they claimed it was against the promise, which the former vice president made to them prior to the national convention in Port Harcourt, Rivers State. The source confirmed to New Telegraph that PDP has been unable to persuade most of their aggrieved governors to accept the Atiku/Obi ticket. “I can authoritatively confirm to you that some of PDP governors are working for President Buhari. The concerns raised earlier by the governors that the zonal leaders were not consulted before the nomination of Obi is still much there. “Some of these governors have also realised that it will be difficult to sustain the level of intervention, which the current government has made in the region, if another administration takes over power,” he said. Similarly, some governors in the South-South, especially those seeking second terms in office, were said to be hobnobbing with the ruling party for self survival. New Telegraph gathered that the plot is to concede the presidential election to the ruling party in exchange for a second term mandate in their states. The main opposition party may also be in for more shockers except it is able to rein in some of its chieftains who participated in the last presidential primary but lost the ticket. The source said that PDP should be concerned that some of these former presidential aspirants have retired to the background and have been too cold towards the activities of PDP since the convention ended in Port Harcourt, Rivers State. Another source said that with the corruption allegations hanging around the presidential candidate of PDP, it is increasingly becoming difficult to market him to the electorate in the North where President Buhari is largely perceived as a man of integrity. The source explained that in the South-West, there is the consideration that the Yoruba will be shooting themselves in the foot if they work against President Buhari who has their son, Prof. Yemi Osinbajo as vice and running mate. New Telegraph sought the confirmation of the report from a top member of APC who said that in politics, nothing is impossible. The party chieftain, who spoke on the condition of anonymity because of the sensitivity of the matter, said it was PDP governors and party chieftains that were making overtures to the ruling party. “Overtures have been made. We are not the ones making the overtures. The PDP leaders are the ones making the overtures. The truth of the matter is that PDP is a divided house and there are many people there who do not like their presidential candidate; unlike in APC where there is no single governor or party leader that does not support the candidature of President Buhari. “They may have their local problems, local politics, but there is no single person that does not support President Buhari. There is a unity of purpose and unanimity of determination to work for the candidate of our party. “This is because for them, their personal survival and second term mandate is more important than their party producing the next president. They are in total disarray and it is for us to capitalise on it. “As for the president, so many factors are just conspiring to work in his favour because we don’t need to work too hard in the South-West to get them to support the president’s re-election. They know that if they miss the opportunity of supporting him and getting the Presidency in 2023, it will take them another 24 years before it comes to them again,” he said. However, National Publicity Secretary of PDP, Mr. Kola Ologbodiyan, has described the insinuations by APC that some opposition governors were working for Buhari as an exercise in self-delusion. “APC and President Buhari are in self-delusion. Even all Nigerians are sick and tired of President Buhari and APC. Not a single PDP governor is campaigning for Buhari. It is just a rumour and it will remain as that,” Ologbondiyan told New Telegraph.